The ministry of Bishop Ford is shared and supported by his beautiful helpmeet, Evangelist, author, and praise and worship exhorter, and Assistant Pastor Lady Shevelle Ford. They are the parents of two children, Trinity and Joseph Jr. Bishop Ford is a native of Jackson, Louisiana. He studied at Southern University of Baton Rouge and is a graduate of Ever Increasing Word Training Center. He also served in the United States Army. Bishop Ford founded Higher Grounds International Worship Center in October 2000. Since its launching, the church has flourished into a fellowship of passionate individuals who are concerned about the salvation and livelihood of their neighbors, community, and surrounding areas. Through a host of outreaches and community projects, Bishop Ford and the Higher Grounds Family have indiscriminately demonstrated the love of Christ to all people regardless of backgrounds or racial differences. 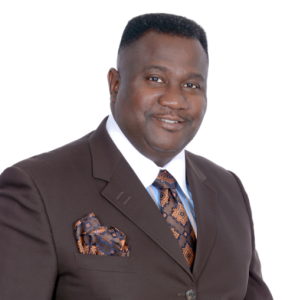 Preaching with purpose, power, and passion, Bishop Ford expounds the Word of God; which as a result brings forth repentance, accountability, and responsibility unto the hearers. He encourages the people of God to not only be hearers, but doers of the Word. God has anointed him to preach faith, love, strength, and financial liberation to the body of Christ as the Kingdom of God forcefully advances to higher ground.